Anger + Gamma Radiation = Hulk. 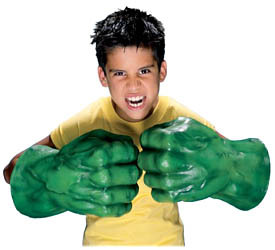 When kids put on these electronic Hulk hands, they'll feel as if they really are the Green Goliath. This role-play set features motion-activated electronic smash and bash sound effects that are activated whenever a child moves his hands.